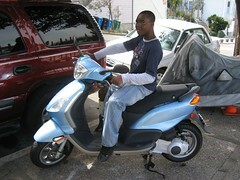 This weekend, T., my LIttle Brother from Austin, came up and spent the weekend with us. We had 12-year-old energy carrying us through the weekend, and it was a hoot to see the city from his eyes. 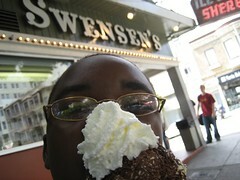 He took this picture himself; it’s a self-portrait with Swenson’s ice cream. He’s pretty good with a camera, and he took a lot of pictures! I just dropped him off at the airport a bit ago. I decided to take the afternoon off today, and it’s a good thing, too, because I could really use a nap! So, I’m feeling a little shy about this, but I’m also somehow compelled to post it. A friend passed along our wedding story to another friend who is a journalist, and K. and I have ended up in the San Francisco Chronicle Sunday magazine, in a feature called “On the Couch.” It’s a series of pieces on the love stories of normal folks like us. Click here to see it. See, the dogs aren’t the only ones who can get some press. Now I have to go out and buy 10 copies of the paper. Yesterday was my birthday, and I celebrated. I took off from work a teeny bit early and K. and I met at Osento for some relaxing hot-tubbing and massage, and then went out for a fabulous dinner at Kokkari. It was awesome. Incidentally, it was January the 11th when we arrived San Francisco. Time to change the blog name again — we’ve been here for six months now. Michelle Shields was walking three dogs, who answered to Tex, Haylee and Xochi when they chose to answer, which wasn’t often. She said dogs are wonderful — better than presidents, even. At the moment, what Tex seemed to understand best was a hot dog a passer-by was eating. He waited with big eyes, hoping for the best. LOL; I can tell they were well behaved as always. You can find the whole story here. 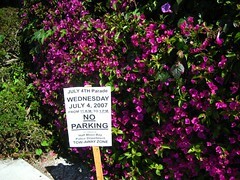 We spent the Fourth of July in Half Moon Bay, mostly; we spent the night before at the San Benito House, to which I’m sure we’ll return. We got up the next morning and strolled around town, watched the parade, and had a lovely lunch at Pasta Moon — great salads there. Then we walked to the beach and enjoyed the ocean … with a lot of other people. It was packed, and quite festive! In the afternoon we headed back to town via Oakland afternoon where we stopped and enjoyed a backyard barbecue, then went home at a reaasonable hour so I could pack for my trip to Oklahoma tonight. We could see the fireworks at Pier 39 from our back deck — we could also see lots of fireworks everywhere, people shooting them of in the streets and off roofs. Big Roman candles and that sort of thing. The explosions continued well after midnight, consistently. Luckily, our Sound Soother allowed me to sleep through it with no problems.